Thin For Good was written by Dr Fred Pescatore in 2000. Fred Pescatore is a Medical Doctor who runs a nutritional medicine practice in New York. He graduated from the American University of the Caribbean. Thin For Good is a low-carb diet program combined with teachings of how to control your body and what you eat through your mind. He’s developed what he calls ‘Mind Over Calories’. It isn’t a diet, Dr Fred, as he is known, says this is a ‘nutritional lifestyle program’. He wants you to stop thinking this is a diet, with all those horrid thoughts that are associated with that word, instead he wants the outcome of this book to be a new way of life for you. At the end of most chapters is an emotion, which is related to eating that he wants you to think about. Dr Fred says it’s a myth that a low fat high carb diet will result in weight loss. In fact, he says, it will probably result in weight gain. Most people simply do not realise that carbs are full of sugar, and will turn to fat in our body. There are many low-carb diets, but Dr Fred believes his is different. During his time working at the Atkins Center, he realised that people needed different diets depending on whether they were male of female and the stage in life (male – 3 stages, female – 4 stages) they were at. In other words, one diet plan is not suitable for everyone. So the plans are divided up so it will work for you, he claims. Additionally there are also plans covering vegetarians, vegans and lacto-ovo. Dr Fred will teach you which carbs you can eat and which you need to avoid, plus the healthy fats that are ok to consume. The book provides a strict 30 day plan with all the meal plans you need. There is no calorie or carb counting as you are expected to follow the plans provided. After 30 days you transition to a final ‘forever phase’ where some foods that were initially removed, are added back into the diet. There is also a chapter containing lots of recipes. Lastly, the book comes with more than 100 mind-body exercises. 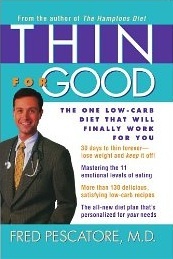 You can buy Thin For Good book at discounted price from amazon. Join the newsletter and get a free welcome pack! Copyright © 2019 Lose-Weight-With-Us.com. All rights reserved.